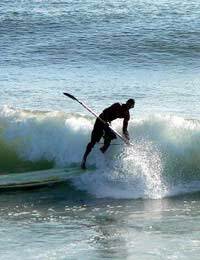 Home > Unusual Watersports > What is Paddle Surfing? The art of riding the surf is an endless source of passion amongst thrill-seekers, with styles forever being revived and reinvented. The latest craze to hit the shores is paddle surfing. From Hawaii to Biarritz to South Devon and Cornwall, the big new blast in the surfing world is stand-up paddle surfing or SUP. This unique hybrid of kayaking and surfing involves the surfer standing on a massive 12ft longboard and using a paddle to propel themselves across the sea and into the raging surf, which is then ridden to shore. For surfers used to lying down and ducking under the wave, paddling through the waves is a completely new experience. The benefit of using a paddle is that allows the surfer to get around to different parts of the break quicker and so catch more waves. It also means that they have a greater versatility in the sea because they can move around in flat water. So if a paddle surfer tires of the wave action they can always go off across the water and explore the coastline. Although it may be a hip new thing to the majority of surfers currently splashing around in the water, paddle surfing is far from a quirky new fad, with roots running as deep as ancient Polynesia. It enjoyed a heyday in 1960s Hawaii, where – under the name ‘beachboy surfing’ - experienced surfers would use the paddle and board technique to ride the small rolling waves at Waikiki. Lost beneath the constant roll of ever newer surfing fashions and fads, the sport effectively disappeared from the surfing scene until the beginning of this century when a group of big name surfers revived it under the new name of stand-up paddle surfing. A new heyday is now dawning with international competitions now being staged in Hawaii and its worldwide participation rapidly growing. Britain has embraced the new craze and lessons are now available to initiate new converts. The surfing conditions of the British Isles are ideal for paddle surfing because as well as the big mighty waves worshipped by traditional surfers, the sport also suits the small, more timid waves that are the norm here during the summer season. In fact paddle surfing can even be enjoyed on the practically wave-free coastlines of Lincolnshire and Kent. For those surfers intrigued by the paddling experience and wanting to give it a go, it is not possible to simply pick up any old paddle and jump in the water with their faithful surfboard or longboard. The sport requires a particularly long style of board to achieve the necessary water floatation for stand-up paddling. The SUP boards available on the market range from around 8 to 13 ft and brand new cost anywhere from £600 to £1000. Beginners and those using the activity for fitness training are advised to use the larger boards, whilst experienced paddle surfers riding the big waves are better suited to the smaller designs. Rather than adopting an old canoe paddle there are a variety of special designs available with a forward-leaning angled blade. The best quality paddles are made from carbon, which makes them both light and rigid, whilst plastic provides a cheaper alternative. It is recommended that the paddle is cut at a length approximately 7 inches taller than the paddler.